Ellison, Kevin S.; Hofmeister, Erik K.; Ribic, Christine A.; Sample, David W.
Relatively high prevalence of pox-like lesions in Henslow's Sparrow (Ammodramus henslowii) among nine species of migratory grassland passerines in Wisconsin, USA; 2014; Article; Journal; Journal of Wildlife Diseases; Ellison, Kevin S.; Hofmeister, Erik K.; Ribic, Christine A.; Sample, David W.
Cohen, Emily B.; Hostelter, Jeffrey A.; Royle, J. Andrew; Marra, Peter P.
Estimating migratory connectivity of birds when re-encounter probabilities are heterogeneous; 2014; Article; Journal; Ecology and Evolution; Cohen, Emily B.; Hostelter, Jeffrey A.; Royle, J. Andrew; Marra, Peter P.
Flint, Paul L.; Meixell, Brandt W.; Mallek, Edward J. High fidelity does not preclude colonization: range expansion of molting Black Brant on the Arctic coast of Alaska; 2014; Article; Journal; Journal of Field Ornithology; Flint, Paul L.; Meixell, Brandt W.; Mallek, Edward J.
Pearse, Aaron T.; Johnson, Douglas H.; Richkus, Kenneth D.; Rohwer, Frank C.; Cox, Robert R.; Padding, Paul I. Accuracy of aging ducks in the U.S. Fish and Wildlife Service Waterfowl Parts Collection Survey; 2014; Article; Journal; Wildlife Society Bulletin; Pearse, Aaron T.; Johnson, Douglas H.; Richkus, Kenneth D.; Rohwer, Frank C.; Cox, Robert R., Jr.; Padding, Paul I.
Ely, C. R., W. J. L. Sladen, H. M. Wilson, S. E. Savage, K. M. Sowl, B. Henry, M. Schwitters, and J. Snowden. 2014. Delineation of Tundra Swan Cygnus c. columbianus populations in North America: Geographic boundaries and interchange. Wildfowl 64:132-147. 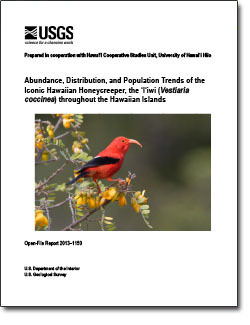 Garrettson, Pamela R.; Raftovich, Robert V.; Hines, James E.; Zimmerman, Guthrie S.
Streby, Henry M.; Andersen, David E.
Paxton, Eben H.; Gorresen, P. Marcos; Camp, Richard J.
Abundance, distribution, and population trends of the iconic Hawaiian Honeycreeper, the ʻIʻiwi (Vestiaria coccinea) throughout the Hawaiian Islands; 2013; OFR; 2013-1150; Paxton, Eben H.; Gorresen, P. Marcos; Camp, Richard J.